Why Choose AFIRE’s Ethanol Ranges? Why Choose Ventless Fireplaces ? Fire has always fascinated our imagination; humanity and fire have co-existed since time immemorial. Nowadays, in an increasingly urban environment, the use of fireplaces has become complicated, with significant limitations. AFIRE offers a means of reviving the pleasure of the fire by creating Your vent free fireplace. An “urbanised” fire, easy to install and to use, a ventless hearth design created according to your taste and suitable for daily use. As such, fire becomes modern and without constraint; it is more flexible and can be adapted more easily to your furnishing preferences. Even better, it actually becomes an element of decoration. The greatest problem for the installation of a hearth is building an exhaust duct for the smoke. The huge benefit with a bioethanol insert or a 3D water vapor fireplace is that you don’t need a flue. All that’s required is to create the surround of the fire and to embedd an insert in this setting. Revive your interior spaces in an instance. Those with a wood burning hearth know only too well: a real biofire is an amazing thing but it is also very restrictive. There is a certain amount of work involved to organise the wood, then there’s the odour, soot, smoke, etc. With the arrival of the vent-free fireplace, these constraints no longer exist. Admire the beauty of flames every day simply by pressing a remote control button. “Alcohol biofires” or ventless fireplace are referred to as such precisely because they use renewable energy or water. With the arrival of the third generation of alcohol made with wood and organic waste, it is now possible to talk about an eco-friendly device running on Eco-friendly fuel. An ecological product that respects sustainable development. 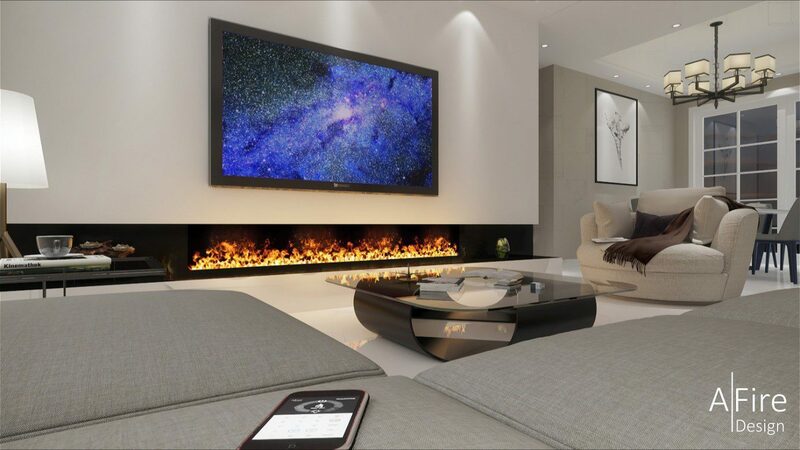 AFIRE manufactures electronic ventless fireplaces which are no longer messy tins filled with alcohol but remote controlled modern inserts fitted with automatic ignition and safety sensors. A line of devices representing considerable progress in this area. A ventless fireplace that is not only comfortable to use but also extremely safe.